A pink post-it note sticks to my wall bearing three little words: more real life. I wrote this phrase after I spent a lot of time on my phone one afternoon and was left feeling rather deflated--definitely not in a sunny state of mind. This note serves as a reminder to myself to get off screens, "unplug" and get out and do something meaningful. The importance of unplugging is a subject that has been coming up a lot for me lately, especially after reading this post. Let's be real, I'm a blogger. I love engaging an audience on social media, staying in touch with blogging friends , and posting all the content of my life. But at some point, this all gets to be too much. I'm not saying I don't scroll through Instagram every day or get inspiration from Pinterest, because I do. But for me, living online is just not part of living an abundant life. I found out that in addition to affecting my lifestyle, living online affects my health. 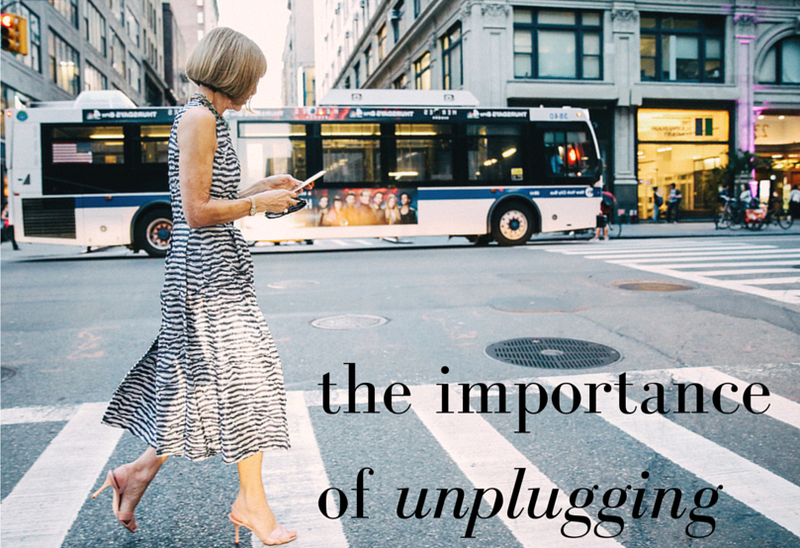 When I read this New York Times article and found out that screen time was actually proven to damage health and mood, I decided to get more serious about unplugging. I deleted the Snapchat and Twitter apps on my phone (I still access them from time to time on my iPad), and I have been trying to stay off my phone before bed. The last thing I do at night isn't check my texts, it's writing about my day in a journal. This has made all the difference. Especially at the end of the day, an iPhone can seem like a beehive of sorts. It's always buzzing with activity and has a million things going on at once. Of course, this can draw us in and make us feel like we're multitasking, when really it just leads to more time wasting and more procrastination. On June 26th I will be leaving on a mission trip, and I'm not bringing my phone. I did the same last year, and it had a huge effect on me. I found myself creating more relationships than ever before, and truly experiencing more real life. I invite you to do the same- whether for a week or an afternoon- turn off your phone and get out there. Create memories that won't ever see social media, memories that are just yours. Fill this summer with memories of abundant living and happy times. Wow, I love this! It's really hard for me to get off my phone, I always feel like I need to be looking at something. It's definitely time to get off my phone this summer. Thanks for sharing and I hope you have a great time on your mission trip! I really loved this post! Sometimes I forget how easy it is to become addicted to your phone, and I definitely need to unplug. Have fun on your mission trip!